All the miles, all the egos and all the sacrifices come down to 17 minutes of racing. Both crews had a point to prove going into the race, Oxford looking to avenge last year’s race and Cambridge looking to create their own dynasty. Both crews powered out the start and to their relief there was no drama unlike the women’s race. 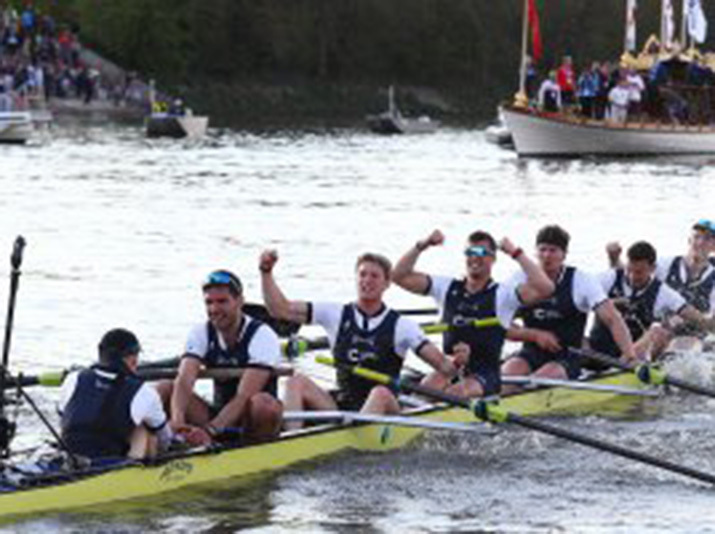 As the lighter crew, it was vital Oxford settled into a strong rhythm and prevented Cambridge from gaining an early advantage. Moving out to half a half a length lead by the Putney Embankment Oxford clearly wanted to minimise the early advantage Cambridge would receive on the Middlesex station. Cambridge capitalised on their advantage and closed the gap to around a quarter of a length. Four minutes in saw the steering of both coxes become extremely aggressive and subsequently many warnings were given for both crews to move apart. In the shadow of Hammersmith Bridge Oxford moved to around a length ahead of Cambridge as a sharp application the rudder caused the Light Blues to slip back. A clash of blades from the seven and two men of Oxford and Cambridge respectively threw Oxford’s rhythm momentarily. However, coming under Hammersmith Oxford had moved to around a length’s lead. With the large Hammersmith bend now in the Dark Blue’s favour Oxford looked to move clear and kill the race. Cambridge refused to give up and as a result, Oxford never moved to more than a length of clear water. Oxford were warned on several occasions to return to their station as it was deemed by Matthew Pinsent that there was not a sufficient gap between the boats for Oxford to take their desired line. Oxford maintained a slightly lower rate of striking and as the crews neared Barnes Rail Bridge Oxford continued to send down puddles as Cambridge closed to three quarters of a length. As the crews entered the final part of the race Oxford looked imperious but Cambridge never gave up and moved back to around two thirds of a length of clear water. This year the waters of the Men’s Boat Race were painted dark blue and Oxford rowed to victory in a time of 16:59 holding Cambridge’s final charge to a win of one a quarter length. For Oxford’s men the celebrations begin. For Cambridge, the narrow defeat of four seconds leaves them empty and seeking redemption in 2018.